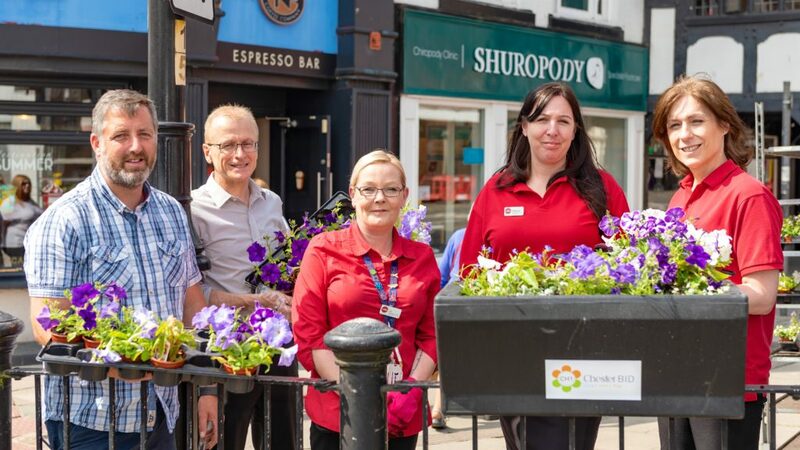 The green-fingered efforts of CH1ChesterBID this summer have been recognised by the team behind North West in Bloom, who have awarded Chester city centre with a Silver Gilt. A number of judges visited Chester back in August when the city was awash with more than 160 beautiful floral displays, all embracing a purple theme to celebrate achieving Purple Flag status – an honour given to UK towns and cities with excellent and well-managed night time economies. North West in Bloom administers the Royal Horticultural Society’s (RHS) Britain in Bloom competition, which is designed to encourage local communities to brighten up their town or city through floral displays. The RHS recently introduced a new Business Improvement District category in recognition of the important role BIDs now play in the care and management of many towns and city centres. Chester is one of only two BIDS in the North West to win the award this year, and the accolade was handed over as part of a special event by the Chairman of Britain in Bloom, Bill Blackledge MBE. Nick White, Chester City Centre Manager at CH1ChesterBID said “We work on behalf of almost 500 city centre businesses and they tell us our floral displays help increase footfall and dwell time in the city centre. This year was our biggest display of floral blooms so far, with hanging baskets, flower towers and barrier baskets across the city centre. “We are delighted to have achieved the Silver Gilt award and would like to thank those businesses that got behind the campaign by adding their own purple themed displays, which added even more colour to our high street this summer. The Council’s Cabinet Member for Environment, Councillor Karen Shore said: “I’d like to say a big thank you to our StreetCare Services teams for their hard work maintaining the wonderful displays and for everything else they do to keep the city centre looking good. The post Top award for Chester’s summer blossoms appeared first on Experience Chester.